Stefan Lanfried lives and plays year-round in Tagish, Yukon. 39 years old, originally from Germany, he has lived in the Yukon year round since 1997. He has a great passion for fishing and is eager to share his knowledge with you. When he is not fishing you can find him hiking, climbing, kayaking or paraglilding & hangliding. He lives at Tagish with his partner Heike, also from Germany. We use a new Lund 16ft SV with a 40 HP 4 stroke Honda, excellent boat for smaller Lakes and also for rivers. 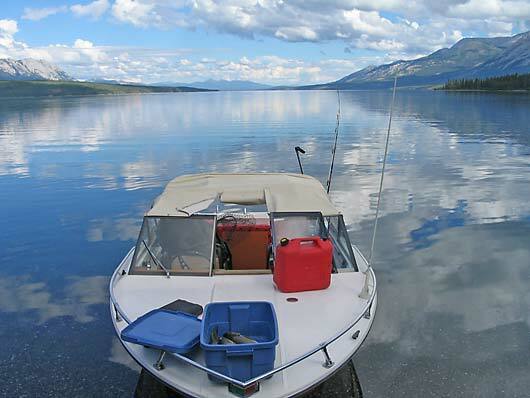 For the larger lakes we use a 18.3 ft Canaventure (with canvas so rain is not an issue) with a 140 HP 4-stroke Mercruiser inboard and a brand new 8 hp Yamaha 4-stroke kicker, which is very quiet for trolling. We can easily outfit 3 people with all fishing rods and tackle.